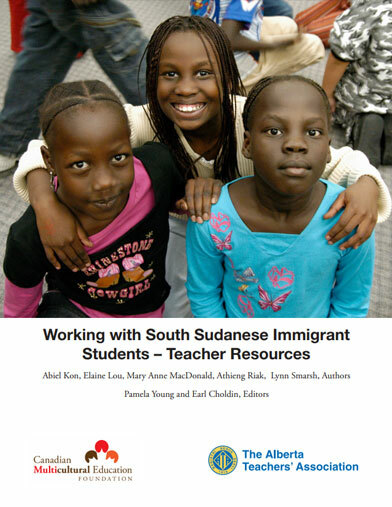 This document was developed by Alberta teachers to assist classroom teachers and school administrators throughout Alberta to better understand the culture and needs of South Sudan immigrant students in their schools.Comments and suggestions from readers and users will be appreciated. Please send them to: Earl Choldin. Click on the cover below to open a printable and downloadable PDF of the booklet. South Sudan is located in East Central Africa, bordered by Ethiopia to the east, Kenya to the southeast, Uganda to the south, Democratic Republic of Congo to the southwest, Central Africa Republic to the west, and Sudan to the north. South Sudan has a total geographical size of 644,329 square kilometres and a population of 8.26 million based on the (disputed) 2008 census. South Sudan has over 60 languages and dialects. All these languages are considered official according to the constitution, but English is the main medium of service used by the government because it links various ethnic groups as well as to the international community. Some states use indigenous languages as the government medium of service in public offices. Before 1899, South Sudan, although not a unified nation state, was under the control of various kingdoms and chiefdoms of ethnically related African nationalities. From 1899 to 1956, South Sudan was part of the Anglo-Egyptian Sudan or Condominium, a joint colonial rule between Egypt and the United Kingdom. During the Condominium rule, the region was administered as a separate territory from the North due to its distinct culture. In two separate wars – from 1955 to 1972 and from 1983 to 2005 – the South Sudanese fought for freedom, equality, and independence against the successive Northern Sudan-led governments. The first war, known as the First Sudanese Civil War, started in 1955 just a few months before the Republic of Sudan gained its independence from the United Kingdom in 1956. This war ended in 1972 with the signing of the Addis Ababa Agreement in which Southern Sudan was granted regional autonomy within a united Sudan. The autonomy provided 11 years of relative peace in the region from 1972 to 1983. A second war between the North and South, from 1983 to 2005, resulted in the death of 2.5 million people and the displacement of about 4 million others. The four million displaced South Sudanese became refugees in Ethiopia, Kenya, Uganda and Egypt. Some of these people later emigrated to Canada, Australia, and the USA. The Republic of South Sudan gained its independence from the Republic of Sudan on 9th July, 2011, following an internationally supervised referendum conducted in January 2011 in which about 99% voted for independence. The 2011 referencum was part of the 2005 Comprehensive Peace Agreement, which ended the 1983 – 2005 war between the North and the South. South Sudan is a country of different ethnic nationalities brought together by shared values and interests. Some of the main ethnic nationalities include the Dinka (Jieng), Nuer (Naath), Azande, Bari, Shilluk, Anyuak, Acholi, Lotuka (Otuho), Madi, Moro, Taposa, Murle, Balanda, Didinga,Boya, and Avukayo. South Sudan is divided into three geographical regions and ten administrative states. Each region or state is inhabited by ethnic nationalities with similar ethnic or cultural backgrounds. The majority of South Sudanese are Christian, while others follow African traditional religions and Islam. Social class in South Sudan is based on traditional royal backgrounds, as well as business and political elitism. South Sudan has four major holidays that are celebrated each year, in addition to two international days that are celebrated worldwide. July 9 – South Sudan Independence Day. The Republic of South Sudan celebrates its first independence day in 2012. July 30 – South Sudan Martyr Day. It is celebrated in memory of our late leader, the founder of our nation as well as in honor of our fallen heroes who died during the struggle. January 9 – The day the Comprehensive Peace Agreement was signed between the North and South Sudan to end the 21 years of war. South Sudanese family relationships are defined by blood, marriage, and through extended and generational family relationships. The community views a family through the way of life of its individual members, so it is important for family members to live good lives to maintain the family’s good name. An individual’s morals, values, and behaviors are important to the well-being of the family and the entire clan. A typical South Sudanese family is composed of a man, one or more wives, and children. Polygamy raises a man’s social status and men with more wives are highly respected. South Sudanese people believe in embracing the extended family. Raising a child is a collective task that involves the extended family members and the whole community. Children are expected to strictly obey their parents. South Sudan is still a very male dominated society, which means that a man is at the top of the family hierarchy. Male children, especially the firstborn male child, are expected to follow in their father’s footsteps and have power to enforce rules or give orders. A man is the head of the family and the bread winner. A woman is the home maker, taking care of the children and household chores. The first wife usually takes a lead role and divides the chores among the other wives. Children take gender specific roles, modeled after their parents’ roles. A girl plays with other girls and a boy plays with other boys. Interacting between genders is rare. Male children assume authority over females. Girls are believed to be inferior to boys because the society has suppressed their natural abilities. Gender roles can have a negative impact on career choice and academic performance. Involvement of children in co-curricular activities is affected by their gender. The majority of South Sudanese came to Canada due to the civil war in Sudan (see history section of this document). They escaped persecution in Sudan, seeking a better life for themselves and their children, which includes having essential basic needs, security, education, and being able to provide for their families in Canada and/or in South Sudan. Embracing the extended family is a significant part of family relationships in South Sudan but its role has become limited in Canada. Raising a child is a collective task that involves extended family members and the whole community in South Sudan, which is not the case in Canada. Children easily adopt individualistic western values as opposed to the South Sudanese communal and egalitarian values. Individual autonomy often becomes more important than traditional values of community or family collectivism. Because of western individualistic lifestyles, children may become rebellious towards their parents and view them as “backward,” making effective parenting a challenge. Parents sometimes work two or three jobs to make ends meet, which makes it hard for them to pay attention to their children’s academic performance. A lack of support from home can lead to poor academic performance and a tendency for children to turn to their peers for social support. The resulting peer pressure can lead to involvement in illegal activities and gangs. In some families, youth drop out of school because they see their parents, some of whom finished university back home, doing manual jobs. Youth may assume that if their parents finished school and cannot work as professionals, going to school is a waste of time. All Saints Anglican Cathedral in downtown Edmonton. The Cathedral provides for the spiritual needs of its members, and also offers language classes. There appears to be no specialized South Sudanese restaurants in Alberta because of a lack of capital to establish one. The Sudanese Canadian Dinka Cultural Society, the South Sudanese Nuer Cultural Society, the Greater Equatoria Community Association, and the South Sudanese Community Association provide summer activities, a satellite channel for news about South Sudan, and language and computer classes. Catholic Social Services and the Mennonite Centre for Newcomers provide a variety of services ranging from hosting new arrivals to providing a settlement counselor to help each new arrival in getting a social insurance number, a health card, opening a bank account and finding a first home. They also give assessment tests to adults to determine their literacy levels and provide recommendations for educational opportunities. In many ways, South Sudanese school traditions are very different from those practiced in Canada. The following information will give you background information on those differences so that you as a teacher or administrator can understand why South Sudanese students or parents may experience challenges with adapting to the expectations of Canadian schools. Traditionally, most parents were reluctant to send their children to school for fear that they may adopt ‘unacceptable’ cultural values and compromise their tribe’s specific cultures. This was especially true for girls. Girls are expected to be submissive, obedient and carry out their duties as defined by society. Girls are expected to learn to be homemakers – how to cook well, how to take care of the children and the elderly, how to welcome visitors and guests and how to host them. In some communities, girls are expected to be married, sometimes at a very young age, in order to bring wealth to the family through a bride price. The bride price affects the chance of a girl finishing school or focusing on school since being groomed for her accepted role in society is the priority. Because a girl is expected to bring in wealth, most communities view the girl as an important resource. This view is popularized among the Nilotes through the proverb: “Nya ku toch.” In Dinka, this translates to ‘a girl is like a river’. A river is the most important cultural resource among the South Sudanese/Nilotic communities, for whom the Nile River has been their livelihood. In this case, a girl-child’s importance goes beyond just bringing in the bride price: she is considered people’s mother – the procreator–and the connector of societies since her marriage to other tribes or clans connects and unites those people, and sometimes allows her birth community to get access to resources such as rivers, land and other natural resources owned by the people who have married her. Girls are expected to not make their own decisions because they may go against the family wishes. Girls are expected to be under the protection of the family and the society. If girls do finish school, traditionally, they have been expected to take up human service careers. This trend has changed recently and, in theory, girls are being encouraged to take up careers of their choice. However, their parents may not have enough knowledge of other careers to help their daughters explore the variety of career options open to them in Canada. Girls wake up early to prepare breakfast before school, and boys wake up later to eat breakfast and go to school. Boys are expected to be brave, aggressive and decisive in order to fulfil the expected role of a family head. Males take responsibility to make sure girls are safe. Boys are not encouraged to mix with girls, and most parents prefer sending their children to gender-specific schools. Certain sports such as soccer are only for boys, and others are played by both boys and girls, such as basketball and volleyball. Traditionally, boys have been encouraged to become professionals such as doctors and engineers. As with the traditional expectation that girls will take up human service careers, this trend is changing recently and boys are being encouraged to take up careers of their choice. Once again, however, parents may not have enough knowledge of other careers to help their sons explore the variety of career options open to them in Canada. The majority of South Sudanese in Canada lived for many years as displaced persons and refugees in northern Sudan, Egypt or East Africa (mostly in Kenya, Uganda and Ethiopia) before coming to Canada. This impacts their ability to adapt to modes of learning here in Canada. The new South Sudanese education curriculum, which is yet to be finalized, is not relevant to this discussion as it has not affected the South Sudanese now in Canada. (It is important to note that South Sudan is a new country as of July 9, 2011, so Sudan’s education system is more applicable to the following discussion). The South Sudanese who are currently in Canada learned through the Sudan education system, which is influenced by Arabic and Islamic discourse, and the education systems in East Africa, which are modelled on the British education system. (East African countries are former British colonies). Some South Sudanese also learned through the Egyptian education system which is similar to the Sudan system because of its Arabic and Islamic influences. There are two types of schools in Sudan: public and private. Most public schools lack resources: classes are overcrowded and sanitation is poor, which affects education quality. Schools are rated based on students’ performances in national examinations in grades 8 and 12. The best students go to the best nationally rated schools. Private schools are more prestigious, have more resources, the best teachers and a lower student to teacher ratio. Private schools teach English from grade 1 to 12 in addition to extra subjects like arts , music, drama and physical education. Children from rich families can afford private schools. The Sudan education system from grades 1 to 4 teaches Arabic, Maths, and Religion and Koran. In addition, in grades 5 to 8 it teaches Humans and the Universe (which includes elementary science topics related to physics, biology and chemistry), History, Social Sciences, Health, Humans and the Environment, home economics and science (e.g.clothing, body physiology, nutrition, cooking, etc) . Secondary schools teach Maths, English, Arabic (literature e.g. poetry, grammar), Religion and Koran, Physics, Chemistry, Biology, History and Agriculture. In the East African education system, especially the one used in Kenya,from grades 1 to 8 students study English, Kiswahili, Maths, Christian Religious Education, Science and Social Studies. In high school, they study English, which includes western English literature, as well as African literature (including literature written in English from an African perspective and oral literature, such as legends and fables). Students also study Maths, Kiswahili, Biology, Chemistry, Physics, and History. Schools in some parts of South Sudan teach South Sudanese languages like Dinka, Nuer, and Zande. Uganda’s education system, which is structured more like the British system with O’Level and A’ Level exams, has also been used in some parts of South Sudan since the 1990s. It is expected to influence the new education curriculum of South Sudan. Students who came to Canada from East Africa will fit into the Canadian education system more easily than students who came from Egypt because of their background in the English language. South Sudanese students who are brought to Canada through the World University Service Canada (WUSC) scholarship program are perfect examples of this as most of them come straight to Canadian universities. Teachers have the right and are entrusted to apply any acceptable form of discipline whenever it is required. Cases that require disciplinary acts vary from school to school but common issues are fighting, being late for or absent from classes, and submitting assignments on time. Common punishments include being caned, being denied the right to attend class, or being assigned to water plants or clean the school compound. Being denied entry to the next grade level and having poor test results publicly announced before the school community and parents are also forms of punishment. Boarding schools are stricter than day schools since the role of parents is limited because students stay as residents at the school for three months at a time. Parents sign agreements when their children are admitted to these schools to ensure that students follow the standards of the school, such as those that govern learning materials, personal items, and diet. There are no cases of drug use or gang involvement in schools or even in the country, at least up to the time this document was written. Few cases of substance abuse (tobacco and alcohol) occur, especially in schools located in big cities. However, if they do occur, they usually lead to suspension or even expulsion. Parents are called to the school when discipline cases are becoming more serious or repetitive to help the school understand the background of a student and make appropriate plans for the child. Parents take over the responsibility to discipline their children outside of school. There is no such a thing as children reporting to school authorities how their parents disciplined them at home. The police are only involved when the child’s health is endangered. School routines vary by region. Generally, schools are open July to October followed by about a month break before re-opening from November to March with a few days break during the Christmas season. April, May, and June are also break months. For the East African system (Kenya’s in particular) which is used in some parts of South Sudan, schools have breaks in April, August, and December. Most schools run from 8 am to 3 pm. Most schools provide breakfast or lunch. After school, students come home, do homework, visit friends and neighbours’ children, play soccer and other games, have supper with family, tell stories and go to bed. After school activities depend on the schools. Some schools have more formal and organized after school activities. This is common mostly with boarding schools. These activities involve various sports and extracurricular activities. There are times for sports, homework and studying especially in boarding schools. Sometimes, if students are found not studying during the study period, they are warned and punished if they repeat. Day school students also have organized after school activities like sports but not as many as boarding schools since students do not remain on-site after school hours. As South Sudan is very underdeveloped, in most parts of the country routines are determined by the sun: people wake up when the sun rises and go to bed when darkness arrives. This influences what students can do after school. Teachers rotate between classrooms while students remain in their respective classrooms. Students sit for national exams in grades 8 and12 (Form 4). The exams inolve writing, reading and listening skills. Teachers schedule practical assessments like carrying out projects for agriculture courses. Students also give oral presentations. Report cards are prepared every term; there are three terms in a year. These report cards are used to determine admission to the next level. Different schools have different policies on passing criteria. Admission to national schools requires higher passing marks than admission to state schools. The lower passing grades (65%) get admission to payam (district) level schools. . District or Payam schools are run by Payam (equivalent to city level government in Canada). It prestigious to get admitted to a national level school and students are sometimes motivated by this to excel in school. Graduation from elementary school (grades 1 to 8) determines the quality of high school students can attend and their eligibility for a scholarship. Graduation from high school (grades 9 to 12 or forms 1 to 4) determines the type of college for which a student is eligible. Types of colleges range from vocational colleges to academic colleges and universities. Graduations are well celebrated. The degree of celebration depends on the level of school and the grade that has been achieved as well as the challenges a student has overcome to excel. For example, a family would slaughter a bull, a ram or a goat and invite the community to celebrate the graduation. Sometimes gifts are presented to a graduating student by relatives and a student is showered with words of encouragement and praise aimed at inspiring him or her to continue in school or do good things for the community. Some stories of high performance are highlighted in the media as another way of celebration. This Youtube video of a South Sudanese grade 8 graduate who received the fourth best marks on the Kenya National Exam can provide a glimpse about how South Sudanese celebrate graduation. South Sudanese parents would like to see their children become doctors, engineers, lawyers, accountants, bankers, and teachers. This applies to both boys and girls but the level of expectation is different. More pressure is on boys as most parents still believe that men are the providers and they should take their careers more seriously than girls. Most youth come to Canada with different educational backgrounds or low levels of education not matching their age because of the war in Sudan which interfered with their chances of going to school. When in Canada, they are usually placed in grades according to their age without consideration of their level of education in English, math and science. Students who came to Canada through Egypt and northern Sudan have had their education in Arabic. Students who came to Canada through East Africa sometimes came directly from South Sudan where they had limited chances to go to school because of the war. When they are placed in a grade based on their age, they sometimes find it difficult to attain the same level of reading and understanding as their classmates who have gone through all the stages systematically. As a result, they appear as if they are not intelligent and can become discouraged by this perception. Sometimes teachers think they are not intelligent enough to attend school and this can lead to further frustration and drop-out. Many youth experience culture shock. They find themselves being bullied or viewed as the “other” by their peers in school or, in Pierre Bourdeau’s words, not having the kind of ‘cultural capital’ that Canadian society values. This includes having a “strange” accent and their previous schooling not being recognized by the Canadian education system. Sometimes they see their parents who were professionals back home become cleaners or security guards or taxi drivers in Canada. The students may assume that if their parents finished school and cannot work as professionals in Canada, then going to school is a waste of time. Some students become victims of stereotyping by their teachers and peers who may associate them with black Americans or the black celebrities seen on television. Comments such as ‘Wow, you are so tall, you must be good at basketball!’ are not only hurtful but can lead to students embracing this ‘myth of fame’, and thinking that they can pursue a career in sports or music instead of taking their school work seriously. The Sudanese child usually dreams of being a doctor, engineer, or lawyer but failure to obtain the required grades or courses to be accepted into university or college means these options are not open to them. When this occurs, they may not explore other options to further their educations because they lack awareness of the diversity of careers available to them.